In September 2012 the outgoing UK chief inspector of constabulary Denis O’Connor delivered a valedictorian address prior to his imminent retirement. The scope of the speech – which was essentially an overview of the challenges facing British policing at the height of government austerity measures – was wide-ranging. O’Connor compared the current service with his early days walking the beat. The crux of the address concerned technology, or more specifically the incentive for forces to better incorporate tech into policing to help save money. While the former chief constable didn’t focus on body-worn video (BWV) specifically, four years down the line it’s clear that the ability to record incidents is facilitating the kind of revolution in police work O’Connor was hoping for. This is because of the ways in which it makes officers’ lives easier – both in terms of their contact with suspects, and when it’s time to produce evidence in a court room. More than that, however, body-worn video is a bellwether technology. Its use reflects the evolution of officers’ needs and also the changing nature – and societal status – of the police, in the UK and around the world. There are, broadly speaking, two options when it comes to the deployment of body-worn cameras in a public safety scenario. The first is to stream the footage in real time, something which at this point is generally only the purview of security companies looking after high-profile public events, for instance screening visitors entering a venue. The other option is to employ onboard video recording technology to capture events, store them on the camera or in the cloud, before reviewing them at a later date. This is the kind of device currently being rolled out by the Metropolitan Police on a massive, 22,000-unit strong scale, initially in the London borough of Lewisham in Autumn last year. 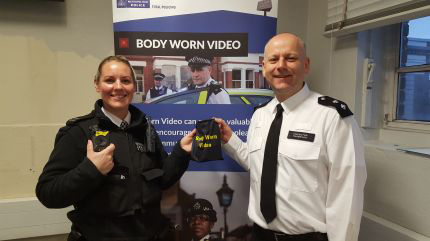 Superintendent Ade Hutchinson is the lead on body-worn video for the Met, whose frontline officers are being furnished with ruggedised Axon Body 2 cameras. The organisation’s mobile and tactical teams, meanwhile, have the Axon Flex 2, which differs from the Body 2 in that it can be worn attached to a helmet. Giving an overview of the technology he explains: “The devices operate in 480p, 720p, or 1080p, and also feature dual-channel microphones to capture audio,” he said. “In terms of memory they have 64Gb of available storage, which is sufficient for 11 to 70 hours of recording, depending on the video format being used. Once their shift is over the officer stores the footage by docking the camera at the police station. The files are then automatically uploaded to Microsoft’s Azure UK-based cloud server via a hardwired connection. Body-worn video has been part of the UK policing conversation for at least 10 years, with forces such as West Mercia investing in the technology as far back as 2007. It’s only in the last few years, however, that the range of crime-tackling opportunities afforded by BWV have started to be exploited to their full potential. With budgets becoming ever tighter, any technology bought with public money has to be seen to be pulling its weight. This has meant rather than simply giving devices to officers and telling them to get on with it, there are now clear, auditable systems in place geared towards increasing effective processes. Policing itself has also become more ‘public facing’ since the coalition government came to power in 2010, meaning any device that helps to make crime-fighting more transparent is worth its proverbial weight in gold. This is particularly apparent in the changes around stop and search initiated in 2014 by former home secretary Theresa May. That discussion is pertinent to the Met, which uses it more than any other force in the UK; stopping 18 out of every 1,000 people in any given operational area. “Stop and search is a really powerful tool, for instance in the fight against knife crime,” says Hutchinson. “It’s also intrusive. As a force we need to demonstrate that we use it properly, and body-worn video is a way to do that. He continues: “In the pilot there has been a 33 per cent reduction in allegations of frontline officers using oppressive behaviour, being rude and using force. When suspects know that an incident is being recorded they’re less likely to complain that the officer behaved badly if that wasn’t the case. Thinking of community relations in particular, one obvious question is what the fallout from incidents such as the shooting of Jean Charles de Menezes – or Mark Duggan – might have looked like if the incidents had been captured on officer-operated cameras. Could the 2011 riots that decimated neighbourhoods across the capital have been avoided if the officers who shot Duggan had been using body-worn video? While the Met’s experience of a fall in complaints is impressive, the results of a 2016 University of Cambridge study of 2,000 UK and US police officers are even more striking. It found that officers’ use of body-worn cameras is associated with a whopping 93 per cent reduction in citizen complaints against police. Control groups suggested that the introduction of BWV had resulted in “large scale behavioural change”, in officers and possibly the public. Going back to Denis O’Connor’s comments, it’s clear that a greater level of reassurance existing between the police and the public can only be beneficial from the point of view of achieving efficiencies. Fewer complaints ultimately mean fewer civil actions, and if suspects are inclined to behave themselves when on camera that’s going to have a positive impact on the use of officers’ time. But possibly the most crucial way body-worn video is intended to make the criminal justice system more effective (and officers’ lives easier) is the use of camera footage as evidence. According to Hutchinson, the devices are proving to be particularly useful in this regard around areas such as domestic abuse, use of force by the police, use of statutory powers, and the aforementioned stop and search. In other words, anywhere there might be, as he puts it, “a bit of rub”. 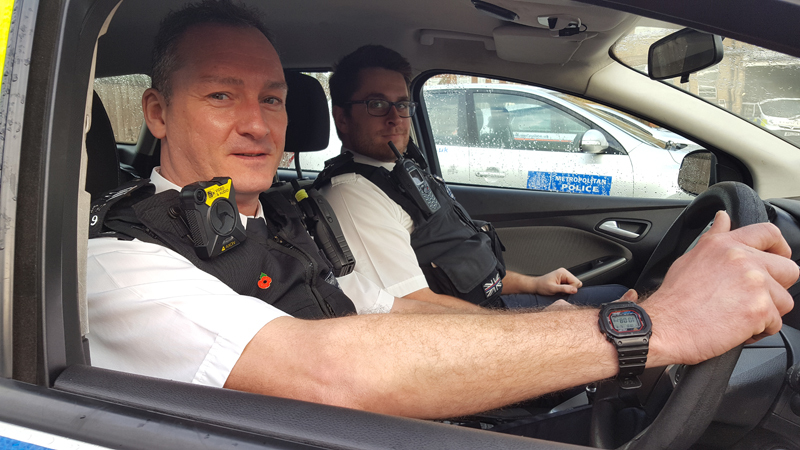 Temporary chief inspector Richard Watkinson is the officer in charge of the Met Police’s Hillingdon BWV launch, which took place this month. He explains how his officers use the cameras, and how that has been beneficial for prosecuting crimes. According to him, once the device is docked and the footage uploaded the officers go through it using Axon’s Evidence.com content management solution. If it’s useful they’ll electronically markup the 20 or 30 seconds of video that will be important once the case gets to court. Links to the footage are then created within the software and shared with the Crown Prosecution Service, using an existing secure electronic submission facility. A video that is not retained as evidence or for a policing purpose is automatically deleted within 31 days. The other side of that, according to Watkinson, is that there have also been occasions where officers have been caught on camera saying things that were inappropriate. This happened recently when an officer got into a fight with a suspect and made some “unguarded remarks”, footage of which the force had no choice but to present to the CPS as part of the prosecution in question. Over the past six years British policing has undergone massive changes, ushered in by a combination of single-minded political ideology alongside an increasingly inventive use of communications technology. As of 2017 – with body-worn camera, and the emergency services’ burgeoning mobile working projects – it seems that we are approaching a point where the technology is ‘bending to the constable’, rather than the other way around. With that in mind it’s worth asking how BWV technology in particular might evolve, considering the across-the-map public safety 4G connectivity on the way in both the UK and eventually around the world. The Emergency Services Network should be just around the corner. The first thing that springs to mind is that comprehensive 4G (and eventually 5G) coverage could encourage a more widespread interest in streaming material in real time. As mentioned it isn’t viable currently, but it soon will be. Speaking on the subject, former employee of the now defunct National Police Improvement Agency Paul Kinsella says: “In the future we could potentially see a situation where high-quality body-worn video is continually streaming back to a central data handling centre to be interrogated. That being the case, you’d start to have a lot of information, which could become more than just a one-way piece. The other factor when looking at the future of policing technology is the ever-changing sociopolitical circumstances in which it might be used. For example, this article was written the day Donald Trump was inaugurated as president of the United States. How will body-worn cameras play a part should the mass civil unrest seen in Washington on January 20 become a regular occurrence in the US (and UK, post-Brexit)? And with American police departments starting to use BWV technology more and more, what will be the effect on an even higher impact policing culture than the UK’s? Baltimore, which is one of several police departments embroiled in recent accusations of brutality, could be showing the way – it released footage of a suspect shooting directly into the public just before Christmas. While there have been exciting advancements and pleasantly unexpected outcomes from BWV, for now we wait... and watch.